I am currently working on my 2nd shawl in my year of the shawls in 2013! I am making it for my mother-in-law, and I plan to give it to her when she comes to NC in September from the Netherlands. I am quite excited to make this for her, and I hope that she will love it and feel the love that I feel for her as I make it. I have completed the Irish Hiking Scarf from Ravelry.com from my father-in-law, Wim, last month. I wrote about this scarf in March. I have also completed another scarf for my brother-in-law, Joram, and I am sure that neither of them expects the gifts that I have made for them. Anyway, on to this shawl. I have embarked on the Rose Leaf Trellis Shawl for my mother-in-law, Grietje. 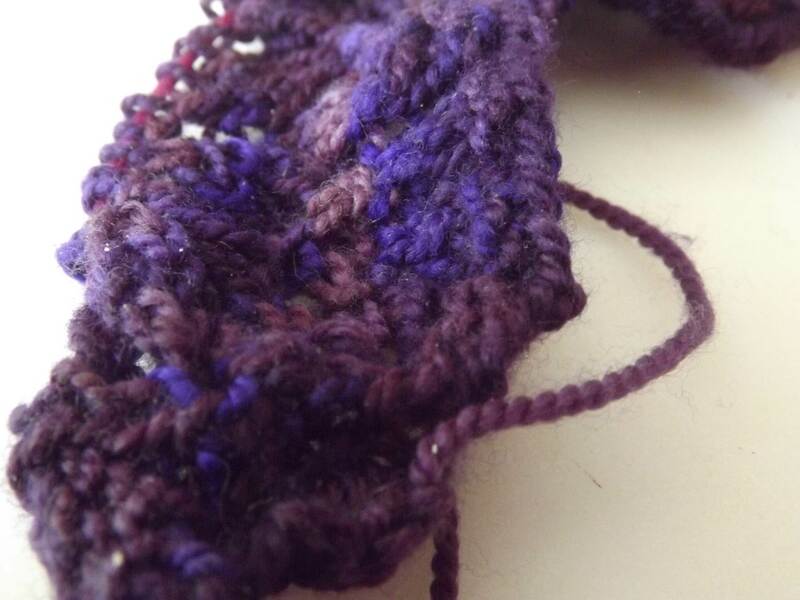 I am using Claudia Handpainted Yarn in a purple colorway, and I must say that it is a pure joy to work with. I love how this colorway is knitting up! It appears to have a different color or shade of purple depending on how you hold it up to the light. Sometimes the brighter colors take the lead, and sometimes the more intense colors pop out in the light. I just LOVE this yarn! I am using the Knit Picks Sunstruck Interchangeable needles, size 6, with a 24 inch cable attached. I also love working with the light-colored cousin of the Knit Picks Harmony needles. I don’t yet have a preference between the 2 of them, but I do love how the patina develops on the Sunstruck needles vs. how soon the patina develops on the Harmony needles. Perhaps that is because the wood is so much lighter. I have frogged this shawl 3 times because I just could not make the stitch count that seemed to be necessary based on the designer’s text. When I contacted her, she told me that on 6 of the rows the count would be off, coming in at only 18 stitches per repeat. She said on rows 7 and 8, the stitch count would come in as it should at 20 stitches per repeat +5 on the end. It was quite confusing the 1st and 2nd time I knitted this. I would get up to having done 3 repeats, which came to a total of 24 rows, and I couldn’t see the pattern starting to develop. After having e-mailed the designer and talking to her a little bit, I have now started it yet again, and I am working on the 2nd repeat of the pattern, up to row 5. I have been very attentive to the pattern, and I have corrected any errors in each repeat because I count each repeat as I do it to determine if I have the right count. I hope that by doing this extra step, I will be able to see the pattern start to develop as it should. I am truly enjoying the pattern, especially since I have finally figured out how the stitch counts work across the pattern. I will be running my lifelines for sure! However, I believe that it will be quite beautiful once I am done. I have figured that if I can do 1 complete repeat of the pattern’s 8 rows each day, I will be finished with it in plenty of time before September 2013 when she arrives. 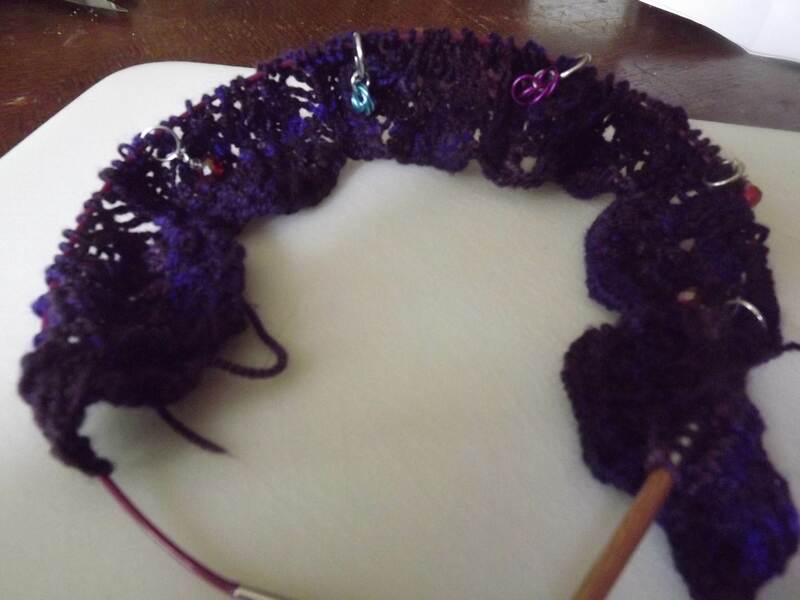 I have to find a nice shawl pin to do this beautiful shawl justice. If you have any ideas on where I can get a musical shawl pin, something like a musical note, or a nice flower pin, I would appreciate the links. Thank you so much! Until next update with pictures, I look forward to reading any comments that my readers care to give me.